Praised by the New York Times as “an artist who makes one hang on every note,” Robert deMaine is the Principal Cellist of the Los Angeles Philharmonic. This event will be streamed on Facebook Live on the Carriage House Violins Facebook page and by CelloBello.com. Former cellist of the Beaux Arts Trio and former cellist of the Guarneri String Quartet Peter Wiley is currently on the cello faculty at the Curtis Institute of Music and Bard College Conservatory of Music. Join us for an evening of food, drink and celebration of all things cello. Browse our contemporary maker exhibit and mingle with fellow cellists and those who love the instrument. Talent Has Hunger is an inspiring film about the power of music to consume, enhance, and propel lives. Filmed over 7 years, the film is a window into the mysterious world of the artist, the passion that can grip and sustain a young player from childhood through the last days of life and the years of sacrifice and dedication a budding artist needs to fulfill one’s talent. The film focuses on the challenges of guiding gifted young people through the struggles of mastering the cello. Through the words and actions of master cello teacher, Paul Katz, it’s clear that this deep study of music not only prepares wonderful musicians, but builds self-esteem and a cultural and aesthetic character that will be profoundly important throughout his students’ lives. Refreshments will be served. As part of Cello Month, The US Marketing Manager for Pirastro Strings Ed Mingo will be giving an in depth talk on cello string construction and how to find your tone. The lecture will feature how the different core materials and metal windings affect the play ability and projection of your instrument to help you create your on unique sound. As an added bonus everyone that attends the lecture will be entered for a chance to win one of Pirastro’s two new Perpetual Cello Sets. Join violin maker Jim McKean as he gives a hands-on tour of the diverse world of the cello. 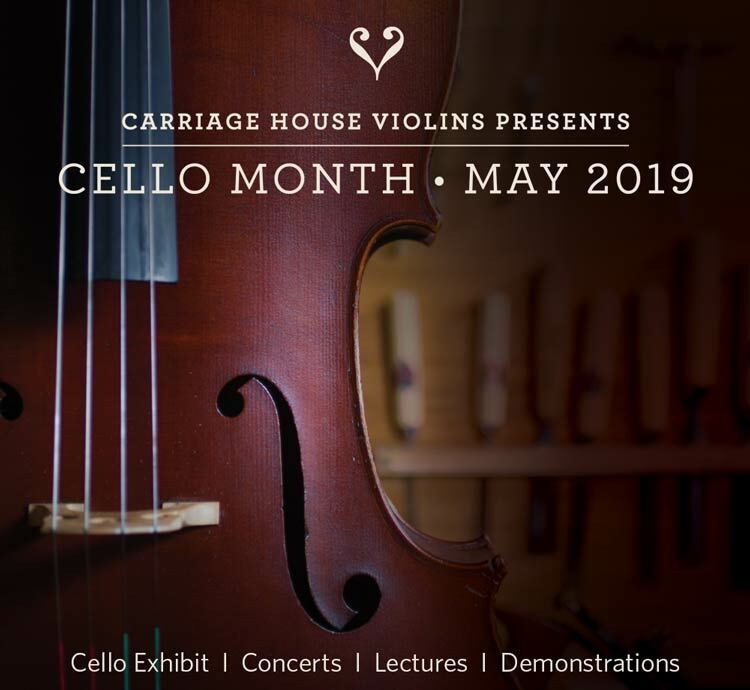 Using many of the instruments brought together by Carriage House Violins for Cello Month, he’ll show how a maker can employ different models and wood to create a unique voice. Cello specialist Robert Mayes will give a demonstration highlighting the variety of sound available to today’s cellist. You’ll be able to see the raw maple, willow, and poplar, along with the various stages of construction. The audience will be welcomed to participate in this exploration of the world of the cello. Cellist Astrid Schween is an internationally recognized soloist and chamber artist. In September 2016, Astrid succeeded Joel Krosnick as cellist of the Juilliard String Quartet and joined the faculty at The Juilliard School. Mike Block is a pioneering multi-style cellist, singer, composer, and educator, hailed by Yo-Yo Ma as the “ideal musician of the 21st-Century”, and acclaimed by the NY Times for his “vital rich-hued solo playing”. Don’t miss this Cello Month favorite! Mike Block is a pioneering multi-style cellist, singer, composer, and educator, hailed by Yo-Yo Ma as the “ideal musician of the 21st-Century”, and acclaimed by the NY Times for his “vital rich-hued solo playing”. Join Mike Block for a demonstration and interactive workshop exploring the musical possibilities with an electric cello, and digital effects. All ages/levels welcome. Free and open to the public. Please RSVP by Wednesday, April 19th to [email protected]. Join us in celebrating the remarkable career of Mark Churchill, cellist and music education advocate. His incredible career as a performer and conductor as well as his tireless efforts to support El Sistema programs in the US have had an incalculable impact on musicians young and old across the world.